The ‘March Madness series of North American College basketball games uses a ‘bracket’ system to eliminate teams. You can use the same bracket system to run a series of debates or individual considerations to identify the most significant / important cause of an historical event. Begin by identifying 8 key factors, which are written on the 8 legs of the 1st Round. 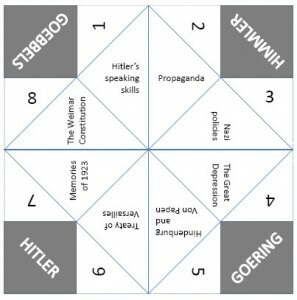 Each pair of factors is debated, with the ‘winner’ (i.e. the most convincing argument) making it through to the 2nd Round. 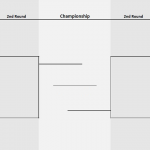 The 2nd Round factors are then debated against each other, resulting in the final two factors making it through the the Championship round. Download the A4 version of the bracket here. 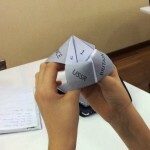 A while ago I saw a brilliant resource from Stuart Godman at www.aheadofhistory.co.uk who had created a peer assessment version of the playground paper ‘fortune teller’ game. It’s great to reach these out as a plenary activity at the end of an intense lesson of historical analysis and get the students talking to each other about their work. I’ve since made a series of ‘fortune tellers’ for different units. The most successful seem to be those which require students to explain the contribution of a specific factor to an event. Students enjoy having a little bit of control over the factor they are going to be asked about, while still maintaining the random element. You can download some examples below. I thought it also made sense to share this editable PowerPoint of a fortunate teller so that you can create your own. 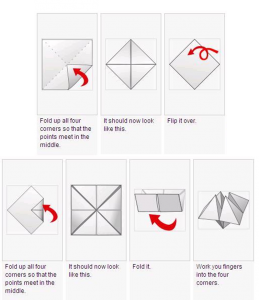 Instructions on how to fold it, in case you can’t remember back to when you were in KS2, are below!